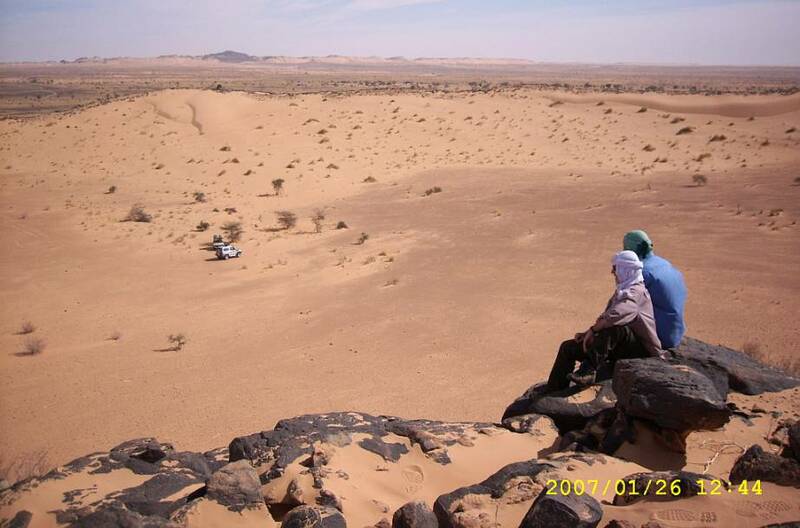 Are the so-called impact craters in Mauritania kimberlite pipes ? 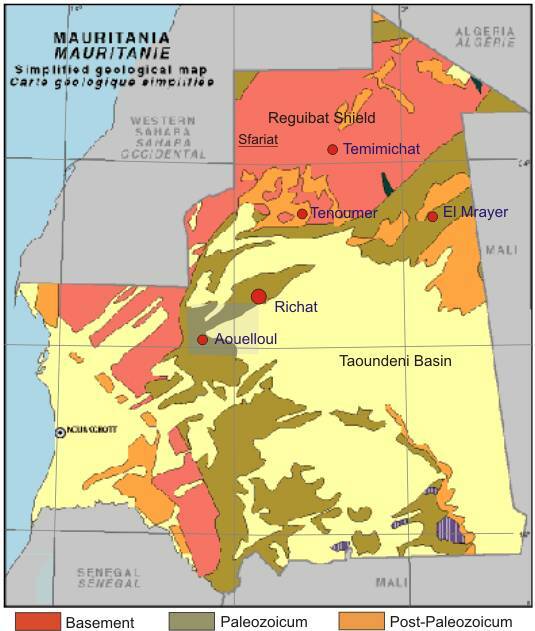 Mauritania comprises four major geological domains. 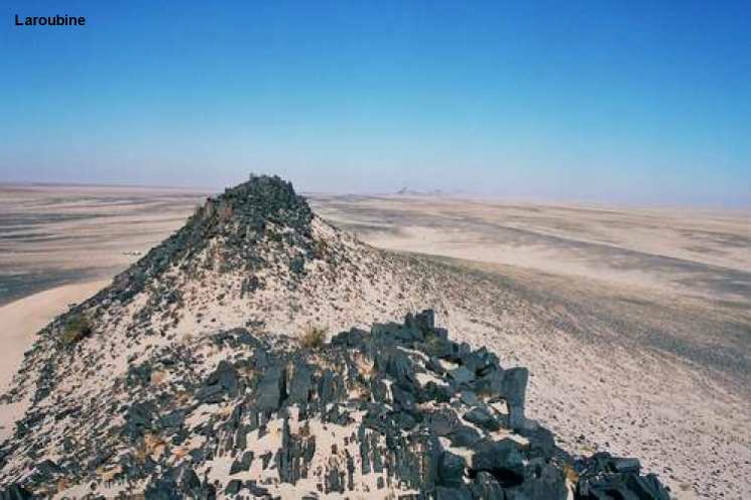 The central part of the Reguibat Shield - an uplifted part of the West African Craton which has been stable since 1700 Ma and dominates the northern third of the country's surface geology. 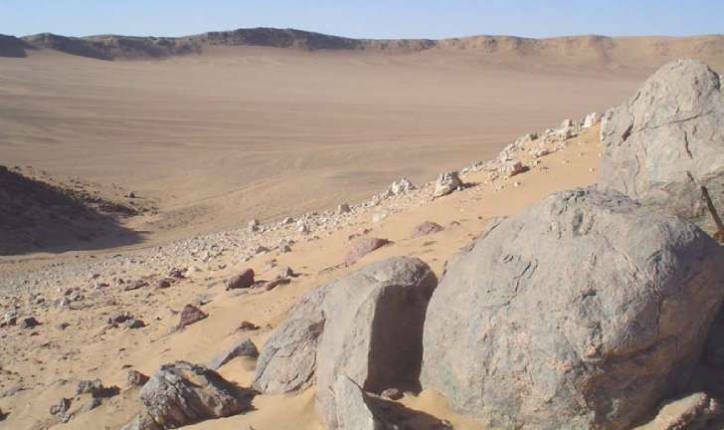 The N-S Mauritanides Orogenic Belt. The western margin of this orogen is concealed beneath coastal basin sediments. 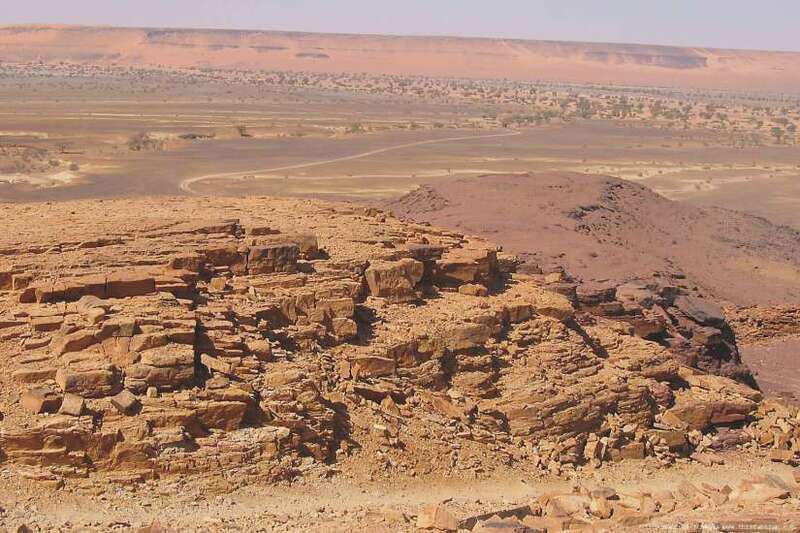 The western part of the Taoudeni Basin infilled by Neoproterozoic to Devonian sedimentary strata unconformably overlying crystalline rocks of the Palaeoproterozoic to Archaean West African Craton. The continental to shallow marine Taoudeni Basin does not exceed 5000 m in thickness, and though it varies somewhat, comprises a remarkably homogenous lithological sequence. 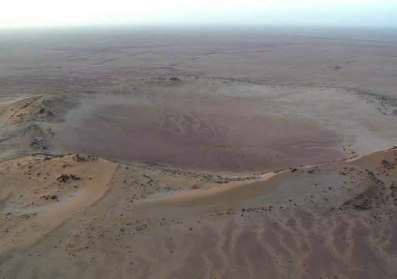 A western Mauritanian Coastal Basin infilled by Mesozoic-Cenozoic sediments. The Reguibat Shield dominates the northern third of the country's surface geology. It constitutes a very extensive portion of Precambrian crust, bounded on its western side by the Mauritanides Belt and to the south it is overlain by late Precambrian sedimentary rocks of the Cambro-Ordovician and Devonian series. The eastern shield or 'Eburnean terrane', with ages of 2000 ±200 Ma corresponding with the Birimian tectonothermal events and predominantly comprising intrusive granites in the west and volcanic formations in the east. The western shield or 'Archaean terrane' mainly with ages of ≥2500 Ma and predominantly comprising migmatites gneisses, granitoids, ferruginous quartzites and Banded Iron Formation (BIF), amphibolites and feldspathic gneisses. The highest grade gneissic and granulite terrain is the Archaean basement located in the western part of the shield in the Akjoujt area where it outcrops as poorly granular, migmatic felsic gneiss and coarsely foliated orthogneisses. 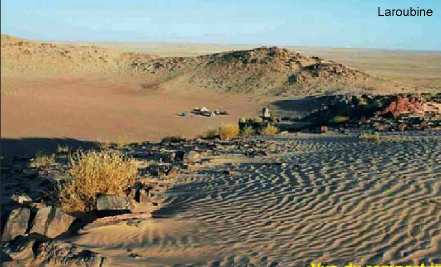 The Taoudeni Basin has experienced only one period of modern oil exploration. Agip and Texaco were each awarded blocks in 1970 with seismic and in 1974 with two drillings. 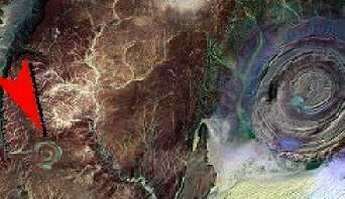 The Taoudeni Basin is a broad intracratonic sag which appears to have formed in response to the Pan-African Orogeny. The basin initiated in the Infracambrian, and continued to develop throughout the Palaeozoic until the Carboniferous. 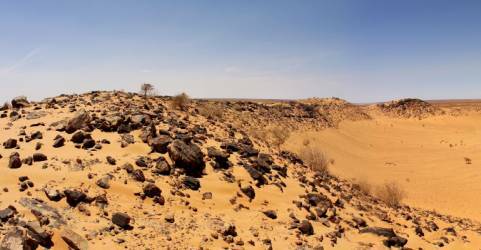 Despite the proximity of the Pan-African, Caledonian and Hercynian Orogenic belt, there is no evidence of significant deformation in the basin. 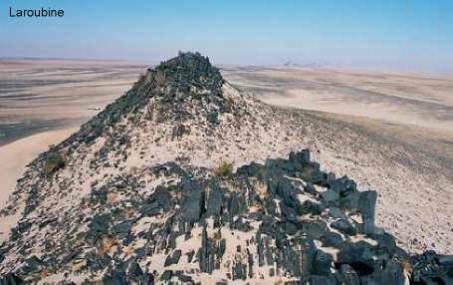 For example, the Hercynian Orogeny, which formed the Mauritanide Fold Belt, is pinned by a fore-thrust in the eastern part of the fold belt, and significant deformation does not appear to have propagated eastwards into the present day Taoudeni Basin. There are some broad, long-lived structural highs through the basin: The northeast striking Abolag–Ouasa High compartmentalises the basin into two depocentres: The Maqteir Depression to the west, and the main Taoudeni Depocentre to the east. These are broad, relatively unstructured depocentres, although there are some large features evident in the 2D seismic data (El Mrayer High). In southernmost Mauritania, a Cretaceous rift basin is superimposed on the Taoudeni Basin. This poorly known basin is only inferred from gravity data. 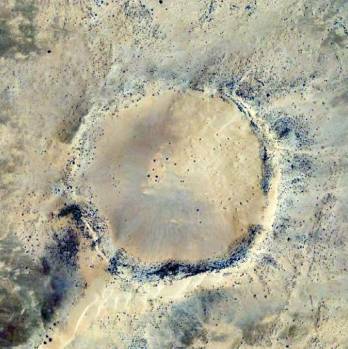 The Nara Rift is a northeast-striking feature straddling the southern Mauritanian border. 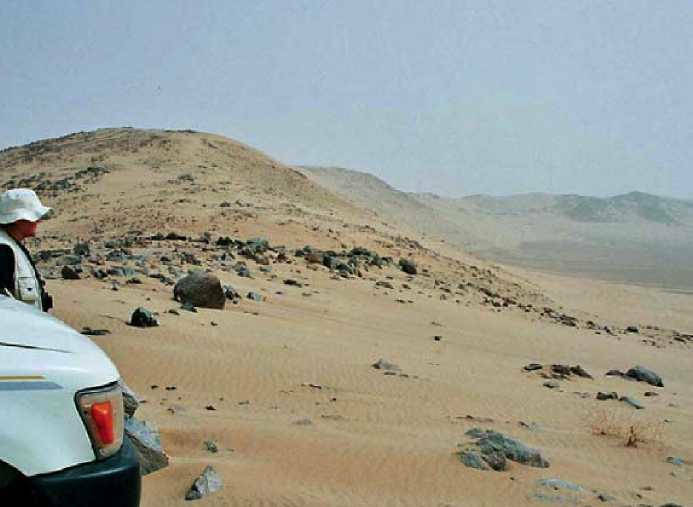 In search of diamonds in kimberlite structures, some companies - Ashton Mining, De Beer Consolidated Mines, Dia Met Minerals and Rex Diamond Mining - in the years 1997 to 2003 explored large parts in northern Mauritania by means of gravimetric and magnetic measurements. It followed also some drillings on promising targets. 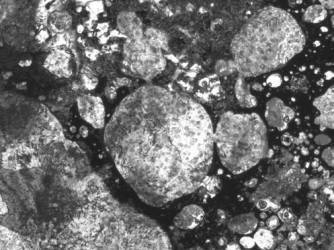 Numerous kimberlite structures were mapped, some of them being diamond bearing. Unfortunately, mostly of the kimberlites had non economic potential. The verification of magnetic and indicator anomalies led also to the discovery of close to one hundred lamprophyre bodies. The bodies are swarms of dykes. 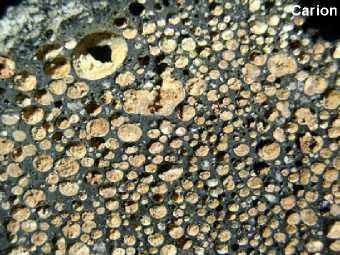 The lamprophyres are highly altered, and some have affinities with lamproites and kimberlites. Rex Diamond Mining discovered a site of diamond bearing kimberlite in 1999. This kimberlite is a coarse-grained tuff breccia. Discovery was based on a 300 meter diameter aeromagnetic anomaly. The pipe is covered by 1.5 meters of loose dune sand. 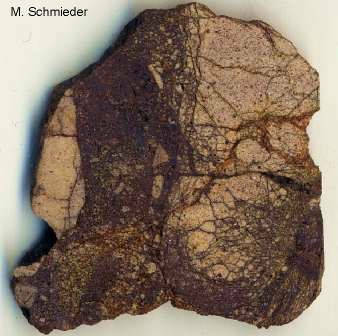 The top 0.5 meters of the kimberlite is intensely calcreted with underlying kimberlite containing ilmenite, olivine, phlogopite as well as ultramafic nodules. A second pipe was discovered nearby. Both of these pipes are within a still larger, circular aeromagnetic anomaly indicating perhaps a common, much larger kimberlite pipe. 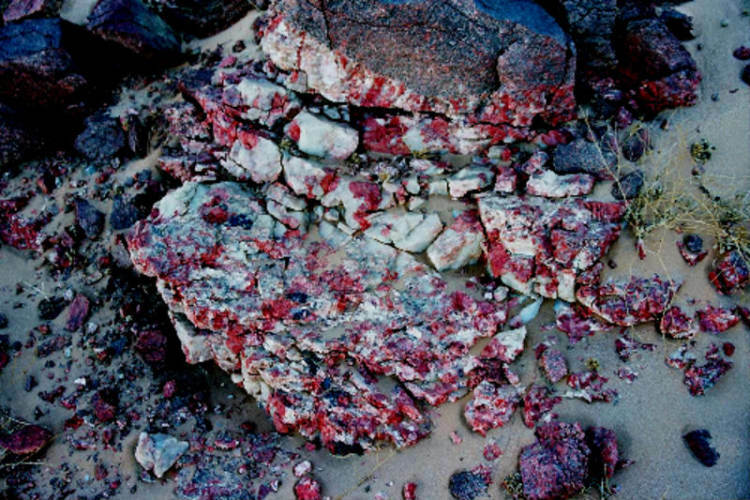 In 1999 Ashton reported discovered diamonds and kimberlites from the Reguibat Shield, and subsequent work confirmed the prospectivity of the region for economic diamond deposits. Processing of selected drill samples recovered 78 diamonds and diamond fragments weighing a total of 2.86 cts. I have not studied the craters at the place. 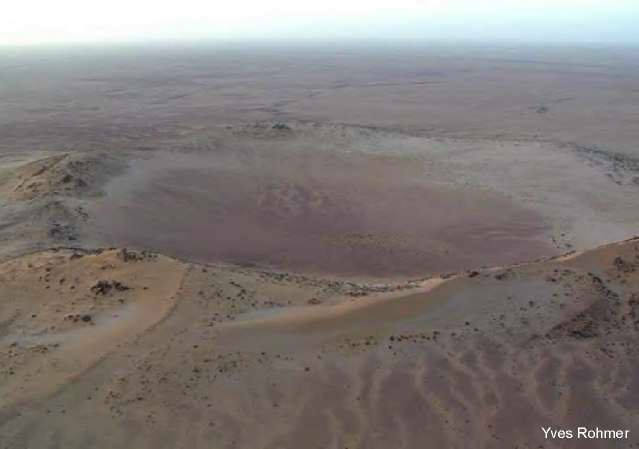 However it is very uncertain, whether the craters of Mauritania have emerged by an impact. There are no proofs for an impact. There are to find clear proofs for volcanic activities. The breccias on the crater rims is composed of crushed granitoid, mafic and metamorphic basement material (Temimichat, Tenoumer) or Paleozoic sedimentary material (Aouelloul). The material was changed by high pressure and heat. Magmatic processes are also responsible for the glassy injections in veins. Polymicte breccias, glasses and PF's are no unique proofs for an impact event. I believe, the craters are subvolcanic plugs. They were lifted up contemporaneously along an active tectonic line. At the region of Sfariat along such tectonic faults are mafic dykes and plugs spread. On the top of these structures the rock layers were erected in the vertical. That is typically for all structures, which are caused by an uplifted magma. All mafic intrusions (dykes and plugs/craters) have emerged probably in the tertiary period. 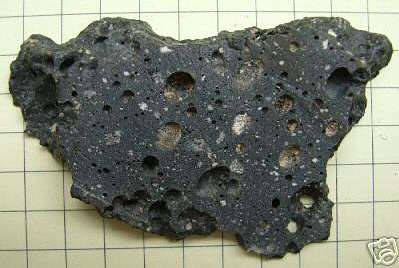 But we can even guess that our craters are kimberlite pipes. 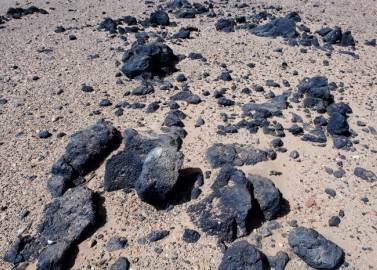 This is pointed by the unusual breccias from the rim of the Temimichat crater and the regional exploration results of some companies in the years 1997 to 2003 (see above). Nobody has explored the underground of the craters by drillings. 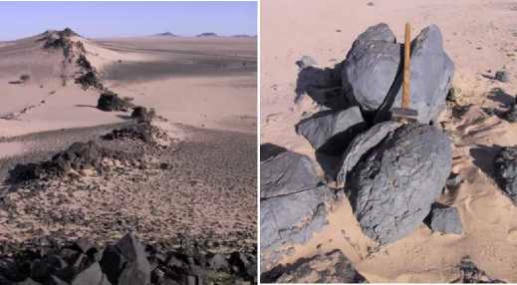 The craters could be comparable to just found kimberlite structures on the East-Sahara-Ghost-Craton (Gilf Kebir, Egypt). 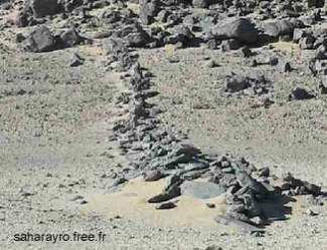 Sfariat: Long mafic rock dyke ? 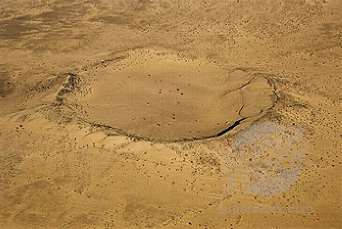 The Aouelloul crater (20°15'N /12°41'W) is a small bowl-shaped crater with diameter of 390 m. It was discovered from the air by A. Pourquié in 1938 and first visited on the ground in 1950 (Monod and Pourquié, 1951). K–Ar and fission track dating of glass by Storzer and Wagner (1977) and Fudali and Cressy (1976) yielded an age of 3.1 ± 0.3 Ma for the crater. Rocks are mainly sandstone of Ordovician age. 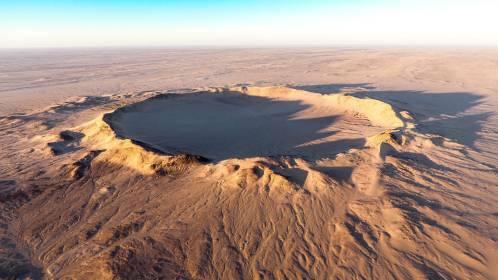 The well-developed rim rises some 15–25m above the surrounding desert and about 53 m above the crater floor. It shows a distinctly overturned sequence of strata. 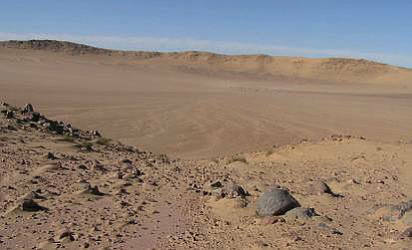 The crater is filled with poorly-sorted, sandy silt that is overlain by well-sorted eolian sand. A gravity study by Fudali and Cassidy (1972) indicated a maximum thickness of the sedimentary fill of some 23 m, which was underlain by a breccia lens to crater floor at 130 m depth. 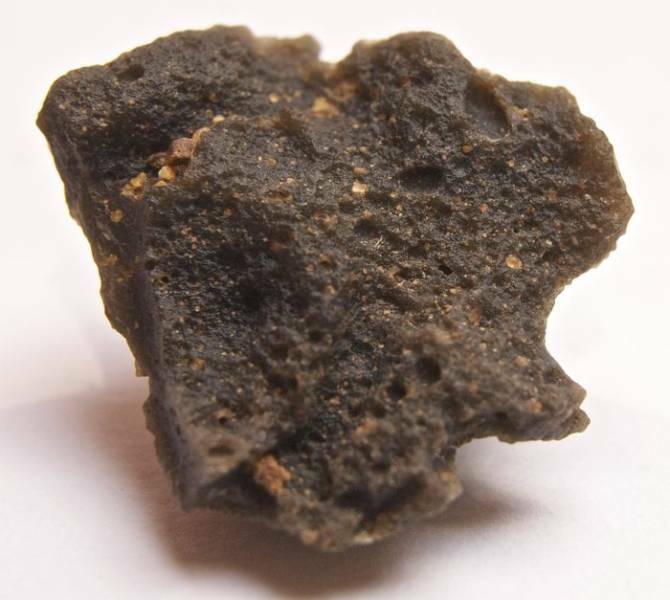 By far most glass fragments were collected on the southern, southeastern and northern outer flanks of the crater rim, and only one tenth of the collection was retrieved on the southeastern inner flank. The glass is heterogeneous with a well-developed schlieren texture. Individual schlieren have very different chemical compositions. There are also digested quartz and feldspar grains. El Goresy (1965) and El Goresy et al. (1968) showed that the glass contains the high-temperature phases lechatelierite and baddeleyite. Beran and Koeberl (1997) determined a very low water content of the glass. Chao et al. (1966) and Koeberl & Auer (1991) found that the glass contain high concentrations of Fe, Co, Ni, and Ir. Koeberl et al. 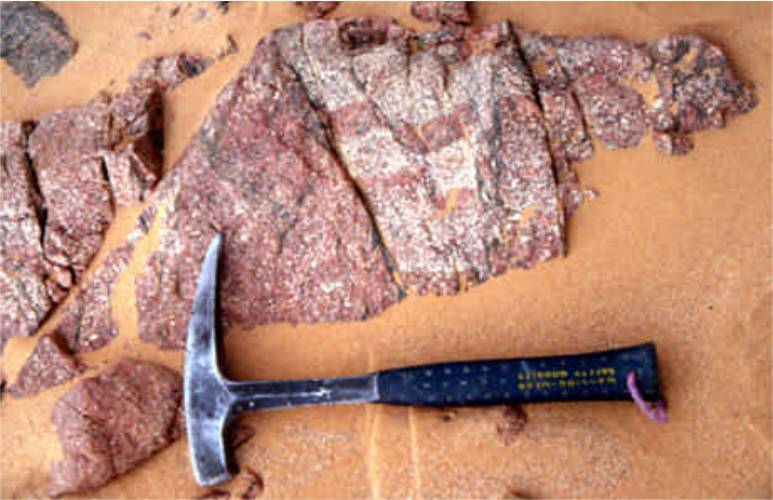 (1998) reported widespread fracturing and shattering of quartz grains in sandstone samples, with subplanar and planar fractures being abundant. In addition, they also described relatively wide and irregularly spaced fluid inclusion trails, with several grains showing two sets of relatively straight and closely spaced trails. However, these authors concluded that this possible evidence of impact was ambiguous: The fact that the fluid inclusion trails had been alleged to be ‘‘healed’’ implied that they were in all likelihood pre-impact features related to the metamorphic history of the rocks. 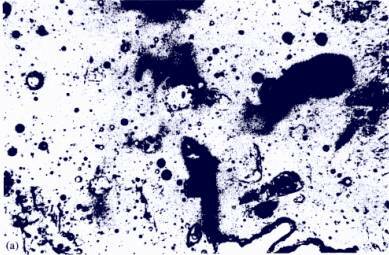 The petrographic analysis having failed to provide definite evidence for impact in the form of optically identifiable shock-metamorphic indicators and the results of previous chemical investigations remain ambiguous. 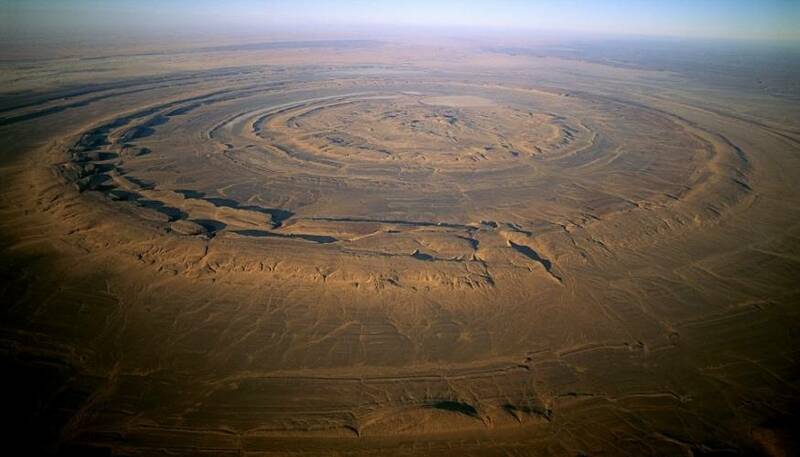 The 1.9 km wide, almost circular crater Tenoumer is located in Mauretania, at 22°55'N and 10° 24'W, about 400 km northwest of the Aouelloul crater. The age of the structure was initially determined to 2.5 ± 0.5 Ma from K–Ar dating of melt rock (French et al., 1970). Dietz et al. 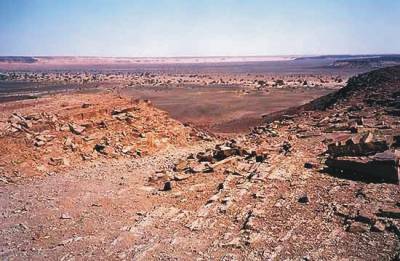 (1969) and Fudali & Cressy (1976) dated the Aouelloul crater at 3.1 ± 0.3 Ma. An age of 1.52 ± 0.14 Ma was obtained recently by 40Ar–39Ar step-heating analysis in the Argon Chronology Facility at Curtin University. The structure was excavated from a peneplained surface of Precambrian gneiss and granite that is covered by a thin veneer of young sediment. The present depth of the crater, measured from the top of the rim to the apparent crater floor, is about 100 m. The depression is filled with unconsolidated sediment. Based on geophysical data by Fudali and Cassidy (1972; also Grieve et al., 1989), the base above the crater fill is estimated to occur at a depth of 200–300 m. The inner slopes are quite steep (Pratesi et al., 2005, refer to it being ‘‘locally abrupt’’). 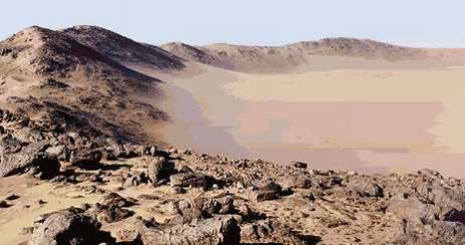 Earliest workers on Tenoumer crater favored a volcanic origin. 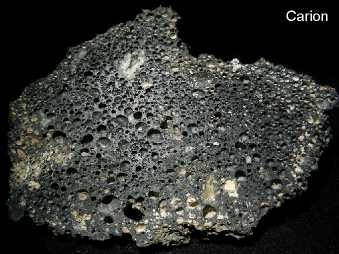 Richard-Molard (1948a) referred to the presence of basalt lava and pumice and suggested a volcanic explosion. Allix (1951) was the first to propose an origin by impact but failed to present conclusive evidence for this. The occurrence of a swarm of small ‘‘dikes’’ supposedly comprising ‘‘rhyodacitic lava’’, intrusive into concentric fractures around the crater or outcropping just outside the crater rim, was interpreted by Monod and Pomerol (1966) as evidence for a possible volcanic origin of the structure. French et al. (1970) reported up to 8 sets of PDFs in quartz grains from obviously strongly shocked inclusions of granite in the ‘‘lava’’. 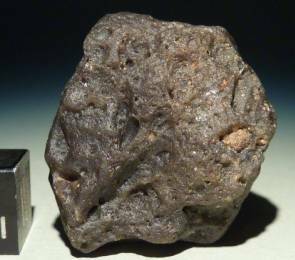 It also contains lechatelierite and diaplectic quartz glass inclusions, as well as ballen quartz. French et al. (1970) reported some Rb–Sr isotope data that showed that the melt was indeed derived from the crystalline basement. Fudali (1974) remarked that the composition of the melt rock does not correspond to that of the gneisses and granites occurring in the regional basement but requires a component derived from amphibolite veins and enclaves found in the gneissic terrain. 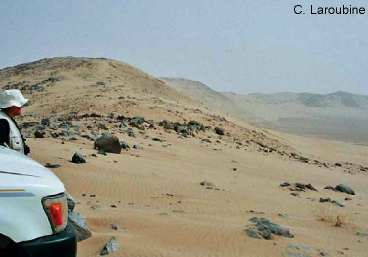 In 2002, an Italian team of researchers visited the crater and collected extensive material for a comprehensive geochemical investigation. Pratesi et al. (2005) summarized these results. 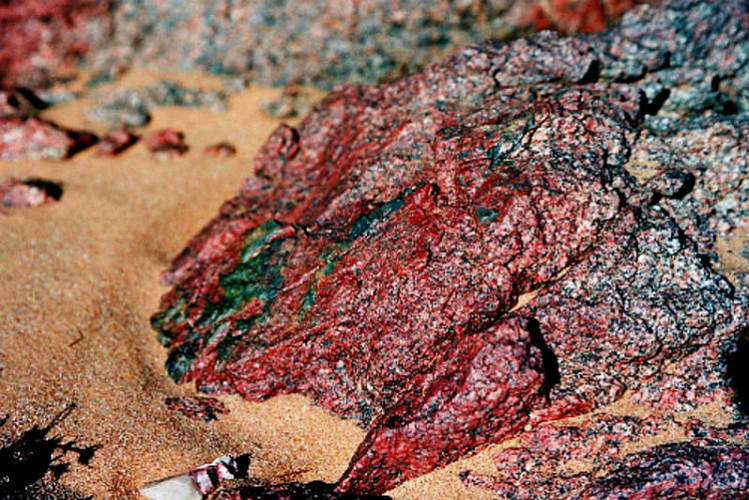 Besides some detailed petrography of the melt rocks, these authors reported extensive chemical analyses, including major element, REE, and platinum group element (PGE) data for melt rock samples and various regionally occurring lithologies. Major element systematics for melt rocks and lithologies show that besides felsic granites and gneisses, a mafic component must have been part of the volume. Mixing calculations of Stoeckelmann and Reimold (1989) reveal that a definite contribution from mafic sources is required. The melt rock composition is best reproduced by a mixture of 50% granitoids, 17–19% mica schist, 15% amphibolite, 10% cherty limestone, and 6% ultrabasite. 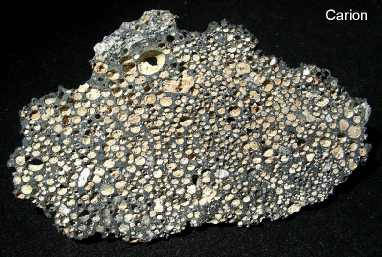 No contribution from a meteoritic component could be detected. Recent analyses of several Tenoumer melt rock samples (bomb and lapilli sized specimens) derived from the outer, northeastern crater rim were reported by Schultze et al. (2012) and Hecht et al. (2013). The range of whole rock chemical compositions is similar to that found in previous studies (Pratesi et al., 2005) and is clearly due to considerable variation in relative proportions of more siliceous rocks (mainly granitoids) and mafic rocks. 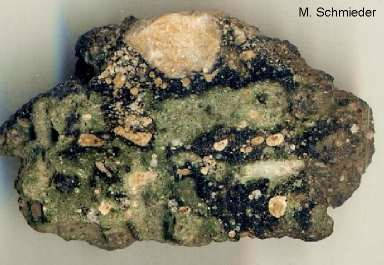 Some mafic clasts suggest that more or less metamorphosed olivine gabbro is also part of the lithological composition. The melt samples are mainly of intermediate composition (andesite to basaltic andesite), but do show significant amounts of olivine microphenocrysts, ranging from 5% to 25% of the groundmass, exclusively in Mg-and Fe-rich samples. 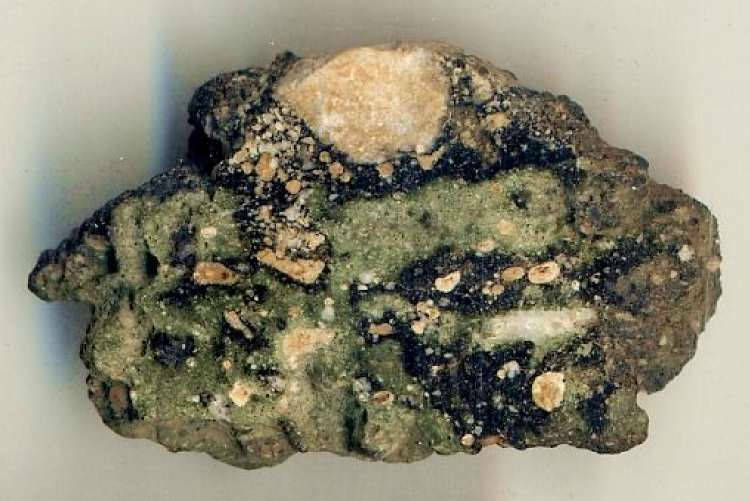 Microtextures suggest that clinopyroxene formed after olivine and orthopyroxene. 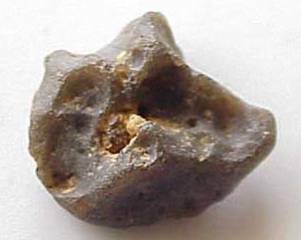 Furthermore, clinopyroxene formed contemporaneously with or prior to plagioclase. All textures are typical for fast cooling, as exemplified by atoll-shaped olivine, or acicular pyroxene and plagioclase. 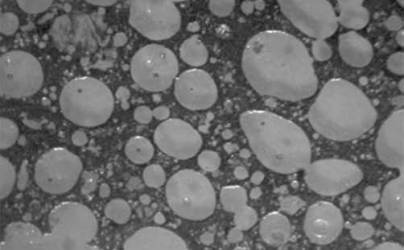 The heterogeneity of the Tenoumer melt rock samples has two main reasons. Two chemically distinct melt phases, a Ca, Fe-rich one and a Si, K-rich one, were analyzed in the interstitial glass matrix. 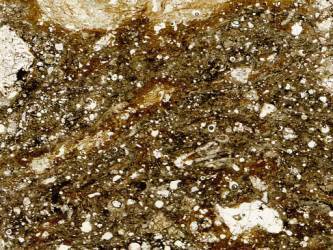 Reimold & Koeberl (2014): Thin section scan of melt rock with a sizable clast of olivine gabbro in glassy groundmass. And backscattered-electron image (partially element color coded) of melt rock groundmass composition. It contains olivine (yellow), pyroxene (blue = opx, purple = cpx), and plagioclase (pl) microphenocrysts. melt-bearing breccia within the proximal ejecta blanket. Melt-free crystalline rocks include granitic gneiss, well-foliated biotite gneiss, amphibolite, and highly sheared epidotitized granite. 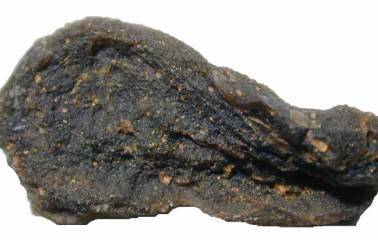 Melt-bearing crystalline rocks consist primarily of clast-rich melt rocks of basaltic andesite composition (Fudali 1974). These deposits are commonly polymict and contain euhedral plagioclase, coherent clasts of crystalline basement lithologies, an ndividual grains of quartz and feldspar. 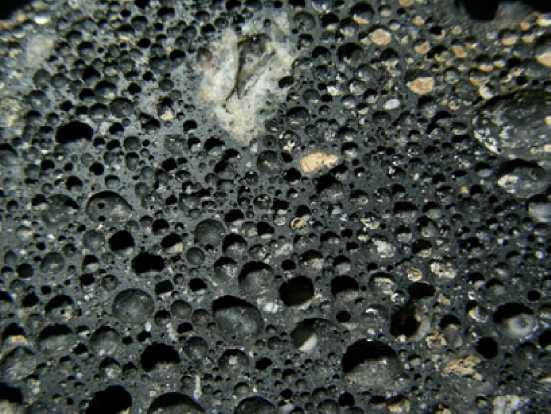 The variety of components that occur within melt-matrix breccias reflects, in part, the complex formation of melt-bearing ejecta. Glass-rich melt breccias contain 1–2 mm amoeboid-shaped bodies of lechatelierite that show clearly visible flow textures (Fig. 4A). Ballen silica is commonly associated with lechatelierite in the glass-rich melt-rocks, where it occurs as both quartz and cristobalite. 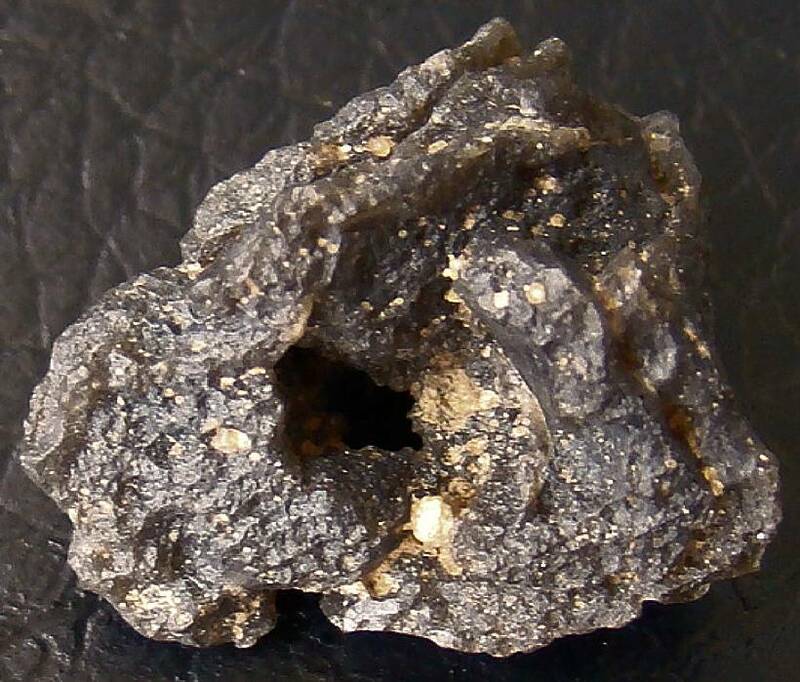 In rare cases, ballen silica is isotropic and, with the exception of the ball-like structure, is indistinguishable from the surrounding lechatelierite, particularly when viewed in cross-polarized light. By contrast, nonglassy impact-melt rocks contain a matrix dominated by euhedral oligoclase laths, up to 1 mm in length (Fig. 4C). Crystalline clasts are common in both the glassy and nonglassy melt-matrix breccias. Clasts include a variety of rock clasts from crystalline basement lithologies, as well as individual included quartz or feldspar grains. Distinctly multimineralic rocks clasts appear to be more common within the glass-rich breccias. The observed clasts are primarily granitic in composition. Crystalline clasts, however, are typically small and contain only 3–7 grains. 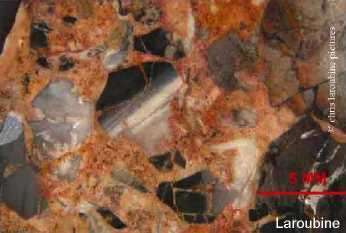 Clasts of broadly granitic composition could represent components of granitic gneiss, or fragments of leucocratic bodies within the biotite gneiss. No clasts rich in epidote or amphibole have been observed." 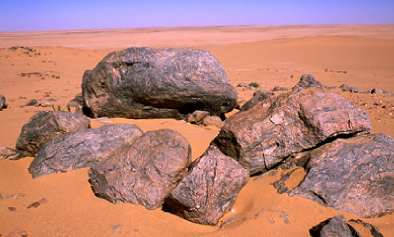 The variety of brecciated rocks so far recognized in the Tenoumer area is quite restricted. 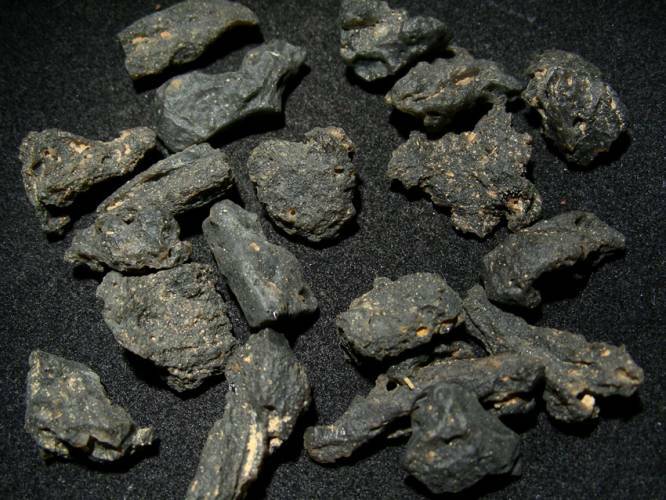 The collected Tenoumer samples are all melt-matrix breccias, containing both lithic and melt components. These breccias are dark gray and display a wide range of porosity, with voids varying in size. 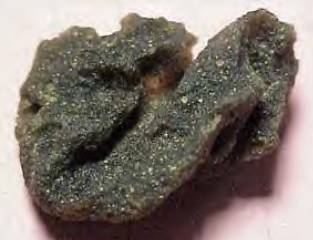 Thus, the appearance of the samples may be dense, slightly vesicular or, more rarely, so strongly vesicular that they resemble a pumice. In all cases, the void density is probably related to the original amount of co-existing vapor phase inside the melts. 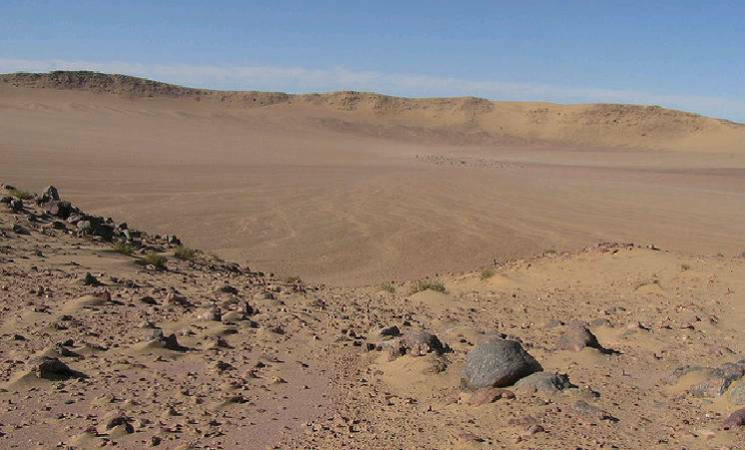 In particular, no large bodies or thick layers of melt have been observed, although their presence could be obscured by sand, mainly inside the crater. The degree of crystallinity of the matrix of the impact melt rocks varies from almost completely crystalline to clearbrown glass containing only a few volume percent crystals, although large glass areas are very rare. Many clasts are granite or gneiss, although clasts of mafic precursor rocks (amphibolites) can be observed. The size of the inclusions range from 1 mm up to several centimeters, and many of them show features distinctive of impact (PDFs in quartz; transformation of quartz to lechatelierite; “ballen”-structured quartz). Around the inclusions occur chilled areas, where a greater amount of glass is present. 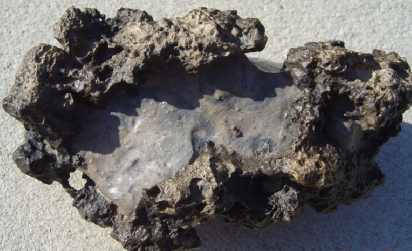 Moreover the glass, which can be clear or light brown, develops apophyses penetrating the fractures of the inclusions. 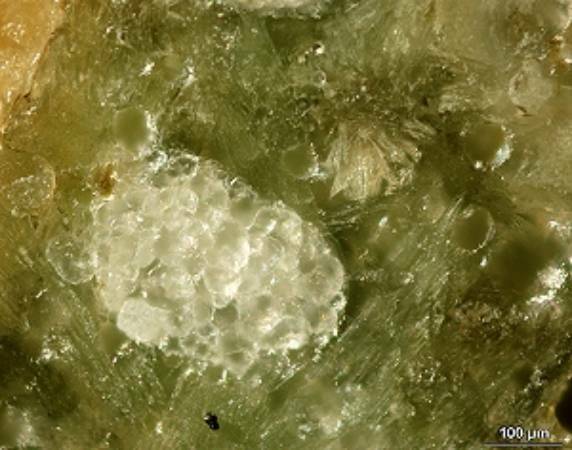 Where the inclusions did not retain their original characteristics (such a conservation only occur in the inner portions of the larger fragments), selective mineralogical transformation may be developed. 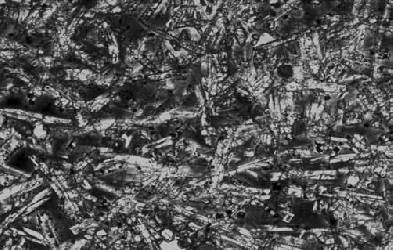 The typical melt rocks consist of a fine-grained intergrowth of plagioclase laths, pyroxene crystals, oxides, and glass. The texture is intersertal to aphanitic and there are no features, like alignment of crystals, suggestive of flow structures. 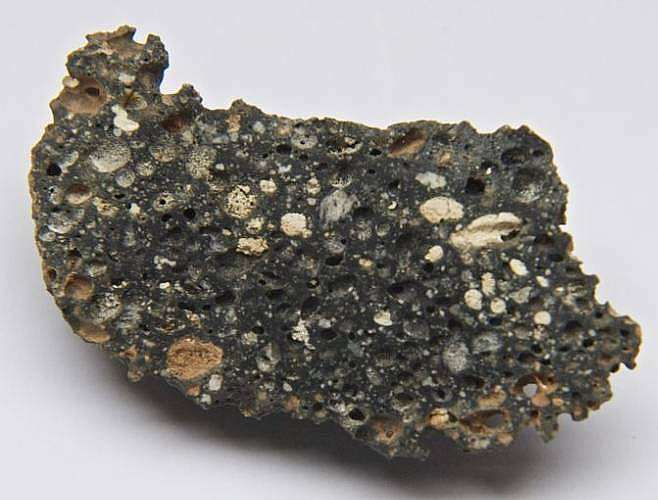 The sample NMNH 113029-15 from the southwestern outer rim of the crater reveals clear textural evidence for liquid immiscibility between the silicate-rich glass of the matrix and the carbonates. Calcite, in particular, forms spherules and globules within the silica-rich glass that sometimes can coalesce totally or partially. 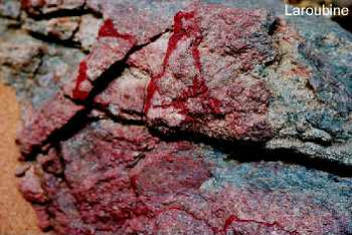 Such textures, sometimes referred as ocellar or emulsion textures, have been observed in natural carbonatitic igneous. 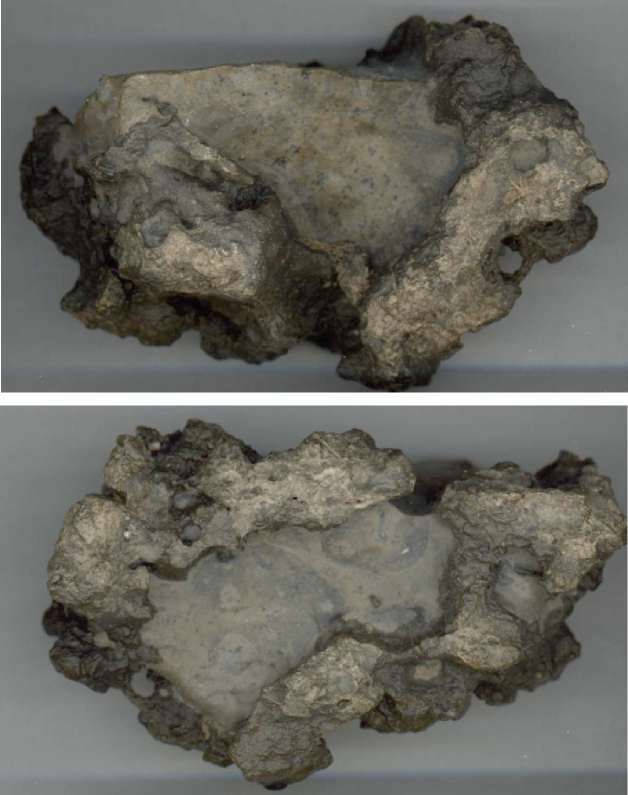 In the past, the presence of carbonates or sulfates in the impact melt glass has been considered as being the product of filling by secondary phases. Analyses of major elements in impact melt rocks show lower contents of SiO2, Al2O3, and Na2O, and higher contents of MgO, Fe2O3, and CaO, than the felsic rocks (i.e., granites and gneisses) of the basement. In comparison with the bulk analyses of the impact melt, the glass is strongly enriched in Si-Al, whereas it is depleted both in Mg and Fe; moreover, the impact melt rocks are variably enriched or depleted in some REE with respect to the felsic and mafic bedrock types. Gold is slightly enriched in the impact melt, and Co, Cr, and Ni abundances are possibly due to a contribution from mafic bedrock. 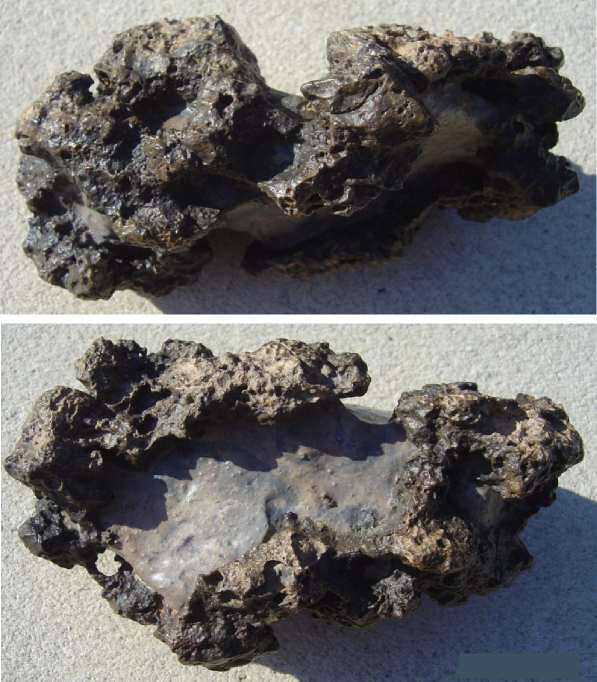 Evidences of silicate-carbonate liquid immiscibility, mainly as spherules and globules of calcite within the silicate glass, have been highlighted. Ballenqartz (rudimentary quartz crystals) in greenish Tenoumer glass !! 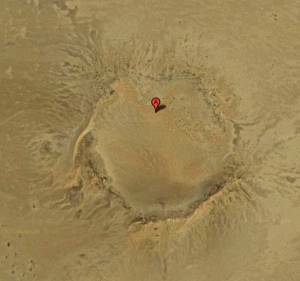 The Temimichat crater is located in northern Mauritania (24°15'N, 09°39' W). The bedrock is made up of crystalline basement rocks, with no sedimentary cover. 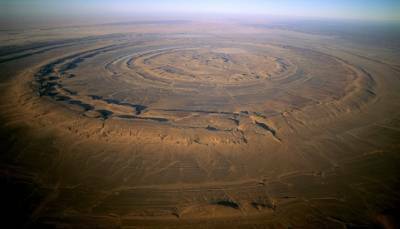 The structure has been listed together with other Mauritanian craters or crater-like features. According to Pomerol (1967), mafic rocks have been found in the area. Basement rocks include granitoid gneisses and gabbros. The crater appears moderately eroded, with a rim height ranging from few meters to few tens of meters. 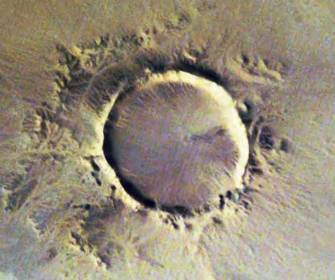 Its diameter is about 700 m.The crater rim is not completely preserved. Large portions are eroded and dissected, or masked by eolian deposits. The rim is mostly formed by granitoid gneisses. The low-lying portions of the rim correspond to the occurrence of gabbroic dikes, which seem to be more easily erodible, with respect to the dominant granitoid bedrock.The crater interior is covered by recent eolian Sediments. Below this surficial cover, sedimentary deposits are likely filling the crater. Inside the granitoid gneisses of the rim, structures that strongly resemble "pseudotachilite" veins crop out discontinuously, and do not occur in the surrounding undisturbed basement. The term pseudotachilite is used with a descriptive meaning only, not implying any genetic process. So-called pseudotachilites are dark to greenish veins of glassy material with fluidal texture at places. 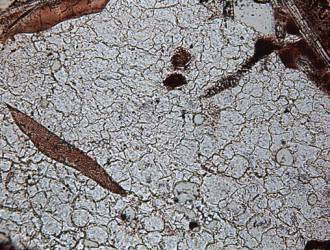 Inside these veins small (less than 1 mm size) fragments of the host rock are present. Pseudotachilite veins mainly appear along small-scale faults, with offsets up to few centimeters. Shear zones are also present, with a brittle to brittle-ductile style. 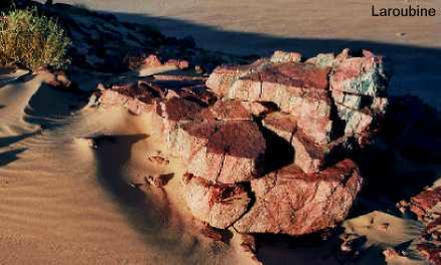 Inside the shear zones, appar-ently re-melted granitic clasts (with dimension of few millimeters up to few centimeters) are visible and their shape varies from angular to highly rounded. The granitoid gneisses have an ipidiomorphic texture with a mineral assemblage formed by quartz, K-feldspar, plagioclase, biotite and some opaque minerals. 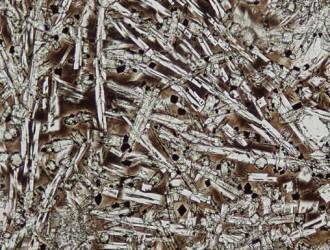 The gabbroic bodies are composed mainly of plagioclase and amphiboles. No ejecta blanket appears to be preserved outside the crater. 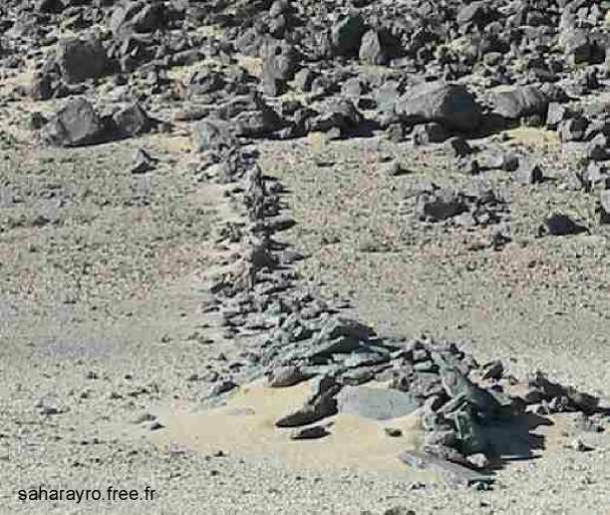 All around the structure only eolian and fluvial deposits are present, with sporadic large rocky blocks that are also visible farer outside the crater, in the surrounding plain. The time of formation of the structure is still unconstrained, but the present erosional level suggests a relatively old age of formation. Conclusion: Temimichat crater has been poorly studied during recent times. No ejecta blanket appears to be preserved. 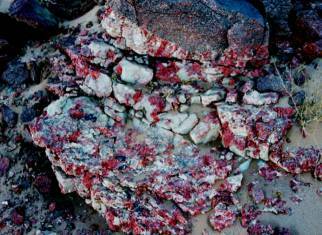 The bedrock is formed of crystalline basement rocks, mainly granitoid gneisses, with locally gabbroic bodies. Granitoid gneisses locally show cataclastic deformation effects and are crosscut by dark veins, that show a striking resemblance with pseudotachilites. Veins are often pervasive. They are linked to small scale faults, with centimetric to decimetric offset. Brittle or brittle-ductile shear zones are associated with these veins, in which rounded granitic clasts also occur. Both veins and shear planes appear fresh, suggesting a relatively young age of formation. No regional brittle structures have been observed. The basement deformational style is ductile and no recent tectonic structures can be observed in the area. These observation could be consistent with the hypothesis of an impact origin (??) for these pseudotachilitic veins. No cataclasites or vein appear in the gabbros. 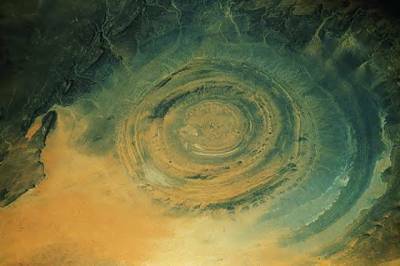 "Granitic rocks with dark glassy veins are to be found at Temimichat"
The 38 km wide Richat structure on the Gres de Chinguetti Plateau in the Adrar region of central Mauritania is an eye-catching feature when seen from space. 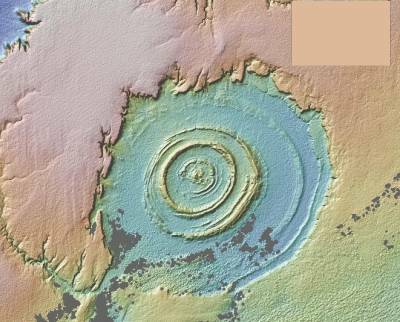 Although reminiscent of multiringed impact structures, field and laboratory evidence suggests that the Richat structure is a dome of endogenic origin. The strata dip outward, so that weathering and erosion of the alternating resistant and non resistant Late Precambrian and Early Paleozoic rocks have produced a series of inward-facing cuestas. 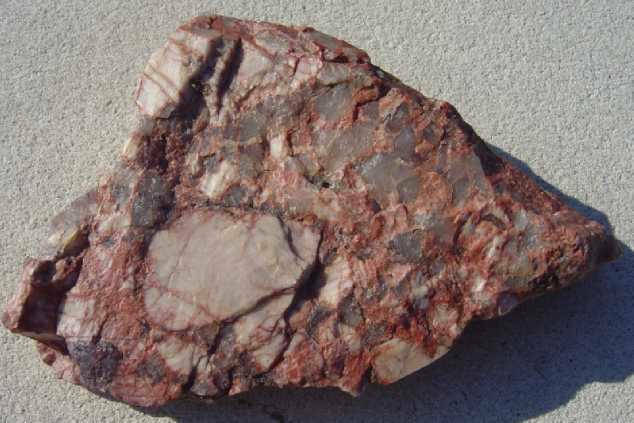 Quartzite forms the resistant circular ridges, and less resistant rocks underlie the intervening annular depressions, some of which contain seasonal lakes. The centre of the structure, the Guelb er Richat exposes flat-lying limestone and some meta-arkose surrounded by a massive ridge of chert and chert breccia. 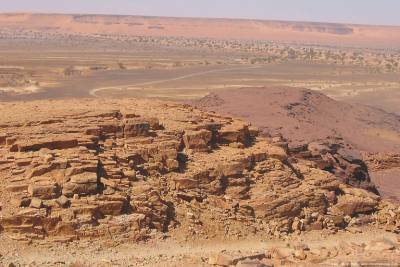 The overlying part of the stratigraphic section, well exposed outward in the dome, consists of Upper Precambrian/Lower Paleozoic shelf facies rocks. The quaquaversal dip of the beds increases inward 20 to 25°; locally, dips are as great as 35°. Some minor radial and tangential faults occur in the outer parts of the structure. The north part of the structure is cut by a fault system oriented 30°NE that appears to be unrelated to the formation of the dome. Reconstruction of the eroded beds of the structure suggests that they were uplifted 3 to 4 km to form the dome. Dips of strata are relatively gentle; strata are even flat-lying at the centre of the structure. Nowhere are beds severely disrupted and contorted. Injection breccia and pseudotachylite-like material, shatter cones, and other shock-metamorphic effects have not been identified. 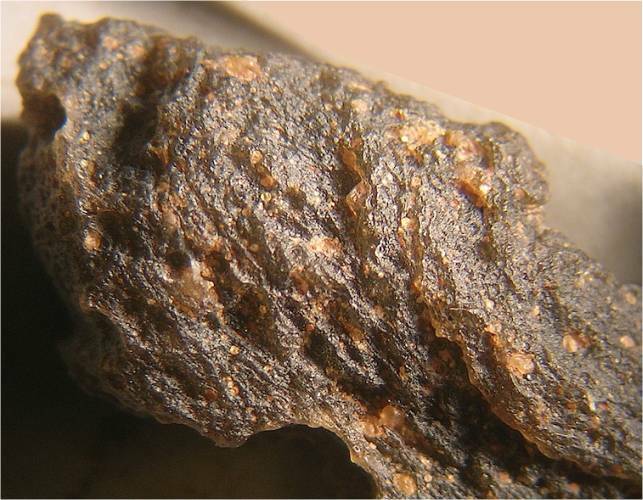 The coesite reported from the rocks of the structure is almost certainly barite that was misidentified. An unrealistic amount of erosion would be needed if Rich at were an impact structure in order to remove shock-metamorphic effects. Studies elsewhere have indicated that severe effects extend downward below the base of a typical impact crater to about one-fifth its diameter; less severe shock-metamorphic effects extend even deeper. At Richat, then, detectable shock-metamorphic effects might be expected to extend to a depth of perhaps 10 km. The fact that none is observed in the rocks of the structure argues for at least 10 km of erosion if, in fact, Richat is an impact structure. 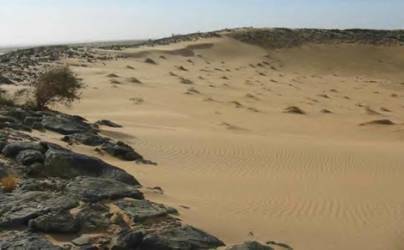 Geologic history of the region does not allow the possibility of that degree of erosion nor does the structure itself show evidence of secondary uplift or deformation, or both. 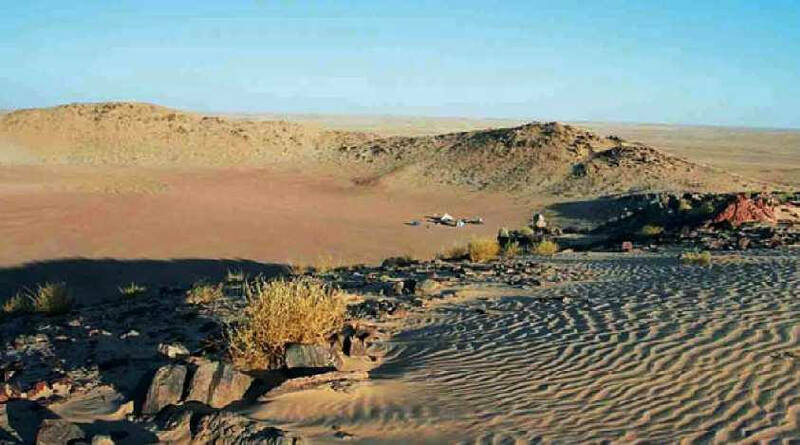 Reconstruction of the beds suggests a maximum uparching of 3 to 4 km, which is a reasonable upper limit to the amount of erosion that has occurred at Richat. The stratigraphy of the Guelb er Richat dome includes limestone, dolomite, sandstone, mudstone and chert. 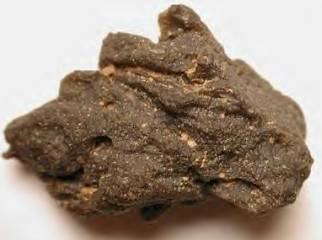 Field and petrologic studies indicate that the breccia is composed of angular and rounded heterolithic chert fragments in a silica cement. Silica dissolution and replacement were observed in the breccia whereas dolomitization and sulphidation were observed in the limestones. Early ductile deformation in the chert indicates an early development of silicification. The chert fragments display a bimodality in the boundary fractal dimension (Euclidian distance mapping) that implies two phases of breccia formation. Field observations suggest that the breccia was form by a process of syngenetic karst-dissolution collapse. The most likely interpretation is that the Richat chert was formed during a shelf high-stand and persisted in a sub-emergent setting from the Proterozoic up to the Cretaceous. Thus, the Richat chert appears to be an indication of a long term high-standing structural position." "A model is proposed in which the intrusion of an underlying magmatic body resulted in the bulging of the overlying crust and production of fluids, thus creating a favorable setting for the dissolution of sedimentary rocks. Formation of voids has led to the collapse and brecciation of overlying units. Thus, Guillaume Matton and Michel Jebrak of the University of Quebec in Montreal, and James K.W. Lee of Queen’s University in Kingston, Ontario suggest in 2005 that this unique structure had a terrestrial origin, ultimately forming from the effects of an intrusion originating from Earth's mantle. "The Richat is the superposition of a bimodal tholeiitic suite crosscut by carbonatitic and kimberlitic magmatic rocks. The bimodal series is characterized by two concentric gabbroic ring dikes and two extrusive rhyolitic centers representing the remnant of two maar systems. 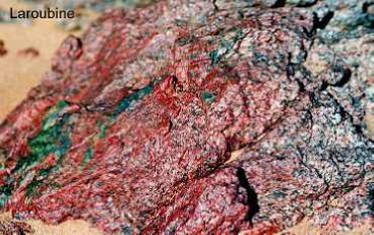 Silica undersaturated magmas occur as carbonatite dikes, a kimberlite plug, and kimberlite sills extruded along the old regional anisotropies filling NNE–SSW dextral strike-slip faults and en-echelon tension gashes. 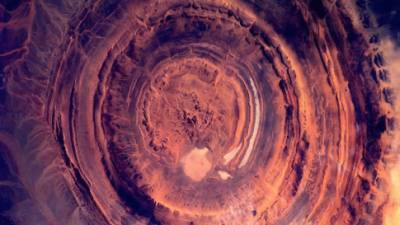 An intense low-temperature hydrothermal event affected the Richat area. It is responsible, notably, for the karst-collapse central mega-breccia, the alteration of the rhyolites, the potassic alteration of the gabbros and the stable isotope enrichment in the carbonatites. A piston-like collapse is proposed to explain the contrast existing between the central and outer part of the Richat. Structural inheritance played an important role in the history of the Richat complex. Pre-existing anisotropies acted as a pathway for the ascent of asthenospheric and sub-continental melts and allowed the coexistence of alkaline and tholeiitic magmas within the same igneous complex." 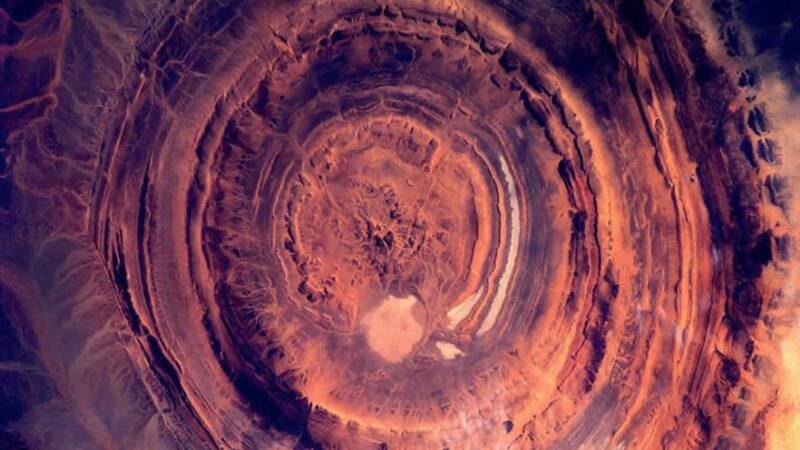 Semsiyat dome, 50 km west-southwest of Richat and centred at latitude 210°'N and longitude 1105°'W, has a diameter of 5 km. Although the style of deformation is similar to that of Richat, Semsiyat is barely detectable on the ground. The structure lies on the Chinguetti Plateau and has only a few meters of topographic relief. Strata dip so slightly that field measurement is difficult. Exposures are poor, and the rocks are extremely weathered. No evidence of shock metamorphism has been discovered at Semsiyat, like Richat, it is believed to be a dome of endogenic origin. 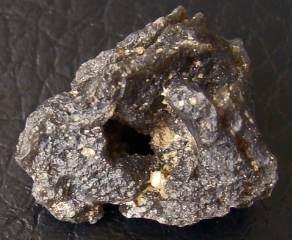 Christian Laroubine, Societe Astronomique de France, has told me: "I sampled breccias on the central zone of Richat. I do not think that we can say that this zone is the central peak of an impact crater, but there is a doubt about a tectonic origin. The components of my samples do not find their origin with a very great depth as could be to it a magma or nearby products. This breccia (left) is astonishing by its structure and its composition. Today, nobody can affirm without controversy if it is of tectonic or impact origin." 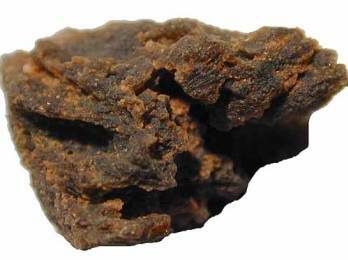 I believe, that these breccia can have emerged also in consequence of endogenic processes. In the doubt is the context important. The Richat - structure has unquestionably a endogenic origin. The finds of this breccia and Coesit (?) are the proof for it, that endogenic processes and an impact - event can produce similar forms. 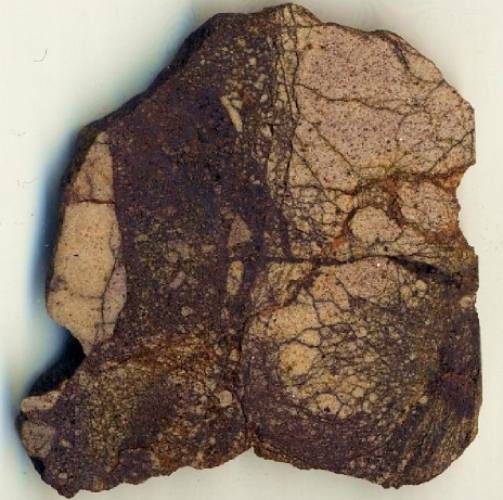 The "shattered sandstone" from Richat reported to contain coesite is a tectonic breccia and probably represents a shear zone developed during the structural doming. 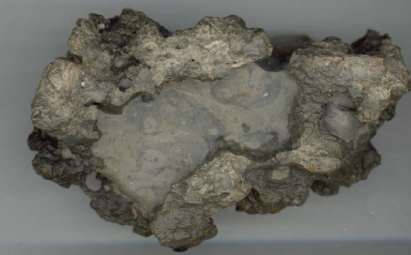 An optical and x-ray examination of concentrates from this breccia demonstrated that the supposed x-ray reflections of coesite are actually due to barite, introduced into the permeable crushed zone by groundwater.